France in London | How do you chose a dentist in London? What is the difference between a private and an NHS dentist? The NHS (National Health Service) is public and so the prices of the treatments cannot vary from one practitioner to another. Private dentists on the other hand can decide themselves of the price of their consultations and treatments. In order to go to an NHS dentist you need to be registered with the NHS in the UK. If you are not (because you do not stay in the UK for long or simply because you have not yet registered for example) you would have to go to private. Some practices can be considered mixed as they are registered with the NHS for basic consultations but also offer more advanced treatments as private dentists and can then decide on the prices they will charge. Are the treatments the same with a private dentist and an NHS dentist? The NHS dentists are as good as the private ones but they usually do not have the most recent and advanced equipment. The reason is simply that their prices being lower and the NHS not being able at the moment to really help, they cannot afford expensive material and tools. The NHS practitioners are often also overcrowded and cannot take all the time they usually would on a treatment. How to decide which dentist to go to? It all depends on the treatments you need, your budget, your availabilities. With an NHS dentist you would pay cheaper but might have to wait a little more for an appointment (except if you are going to an emergency dentist in case of an sudden infection or tooth fall for example). You might not get high quality treatments (although usually more than decent) and you have much less opportunity to choose the dentist that suits you best. A private dentist would be more expensive and, except if you have a private insurance, would not be reimbursed at all. However, you could probably get an appointment sooner and would have more choices in terms of the practitioner such as the language spoken for example, if you feel more comfortable explaining your issue in your mother tongue. 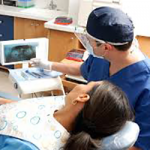 You would still have to look a little to find your perfect dentist but there are platforms that can help you. Findoc for example allows you to book online with health professionals and gives you all the information needed so you can make your choice. If you are looking for a French dentist, the platform will list them for you and you can just book in one click!